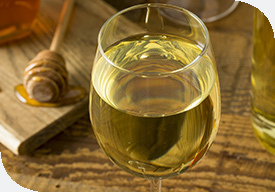 Mead, the old English word for honey wine, is a tasty, lesser known way of enjoying honey. The honey’s subtle floral hints and flavours offers a sweet taste. With bees collecting nectar from a variety of flowers honey provides a unique taste, with no two batches of mead tasting the same! The most cost effective way to make mead is to use honey from your own hives or contact your local bee keeping society and purchase from a bee keeper. Buying at retail prices is expensive in big quantities. Minimal equipment is required to make mead. To get started you’ll need a one gallon jar with bubbler, steriliser tablets, white wine yeast, nutrient and hydrometer, totalling around $25. With good water quality in New Zealand, using tap water to make mead is fine. You may want to experiment with the mead’s taste by using either filtered or mineral water. The purer the water, the less it will taint the mead’s taste. For the best flavour take great care in keeping your equipment clean. Also great tasting mead is due to great tasting honey – so use honey you enjoy the taste of! Making mead takes patience! With the hardest part being waiting for the mead to clear in the fermenting jar. Fining agents help speed this process. Sometimes the mead will clear and sediment will settle within weeks, while other times it may take months. Siphoning the mead without disturbing the sediment at the bottom of the bottle is tricky. Try using a racking cane and a length of food grade PVC tubing with a tap to make this easier. It’s really important to sterilise honey before adding in the yeast as airborne microorganisms can cause bacteria to grow in the honey or must (honey and water mixture). To sterilise, use a campden tablet. The longer you leave the mead bottled the better it will taste. It comes down to your patience again. Can you leave it months or a year like it needs without giving in and drinking it! Serve straight mead (no fruit or spices) slightly chilled. Barry Bunn is an organic chemist and keen home brewer who has been making mead for five years. His favourites are melomels (honey mead with fruit) such as blackcurrant, raspberry and lemon zest.